Priority Aviation provides aircraft maintenance and repair services in Mena, Arkansas. Mena Intermountain Municipal Airport "MEZ"
Family owned and operated full service aviation repair facility specializing in maintenance and modifications . Due to the quality, honesty and reliability we have grown into today's Priority Aviation. Offering all facts of aviation ranging from flight instruction, maintenance, custom restoration, rebuilding, restoration management/consulting to aircraft and parts sales. All of the staff are mechanics, pilot/student which enables us to communicate with customers on a higher level. The staff contributes to the services in their own way while still sharing the common core interest in overall aviation safety, engineering, new performance and efficiency concepts. 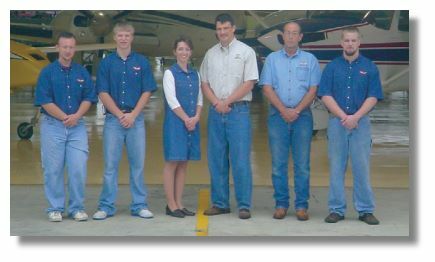 We have a CFI/CFII/MEI, IA's, A&P's, sheet metal technicians and even the office personnel are student pilots. The personnel's integrity, professionalism, enthusiasm, as well as the diversity of services offered is what makes Priority Aviation, Inc. stand out among the crowd. Please feel free to contact us with any questions you may have or just to talk airplanes.